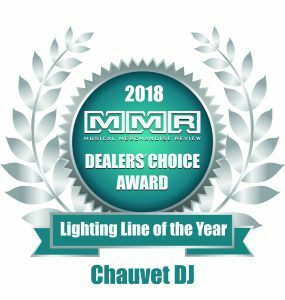 Sunrise – CHAUVET DJ has once again been named Lighting Line of the Year in the 2018 MMR Dealers’ Choice Awards. This marks the sixth consecutive year that the company has received this honor, which is based on voting by dealers across the US. Short points out that 2018 was a powerful year of lighting innovation for CHAUVET DJ with the release of new products like to the CHAUVET DJ line of Bluetooth® wireless technology compatible lighting and the accompanying BTAir app as well as the compact Freedom H1 and Freedom Flex H4, the first 100% wireless product of its kind with a removal battery.